Personalised Calendar A3 Portrait. Go large with your calendar! Our A3 personalised calendars are the perfect photo calendars for the home or office, displaying at a glance the full month ahead. Personalise every month with a wide range of free backgrounds, special effects, lay-outs and clip-art graphics designed to enhance your photos and show them to best effect. Wire bound in white with a hanging loop, your photo calendar means your photos of family and friends can cheer you up every day of the year. Remember your photo calendars can start on any month of the year, so it’s a great gift idea for Christmas, birthdays and special occasions. Size: 297mm x 420mm portrait. Paper: Printed on 250gm gloss photo paper. 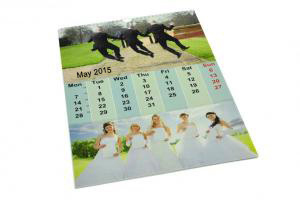 Our free software is easy to use and makes creating your photo calendars quick and simple.